Attaching a blade to the handle is easy. Grasp the blade with a needle holder just above the opening of the non-cutting side. Align the groove on the handle with the opening of the blade. Slide the blade into the handle until it clicks into place. 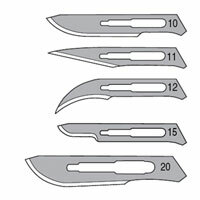 Scalpels come in packages of 100 and are individually packaged as sterile units.